The PythonX CNC plasma cutting fabrication system available from Power Machinery Australia is designed for the mining, manufacturing, boatbuilding and defence industries in structural steel fabrication and beam cutting applications. The 6-axis robotic PythonX CNC plasma cutting fabrication system is based on a new technology that brings automated 3D fabrication to processing beams, channels, HSS, angle, plate and bar. Power Machinery Managing Director Ken Christensen describes the PythonX as having the flexibility to be ‘an entire fabrication shop in a single machine’. Even a modern, fully automated metal fabrication shop typically requires transfers and conveyors to feed and offload multiple pieces of equipment, which take up a lot of space and time. A 'mostly manual' steel fabrication shop would need about 30 minutes to lift, flip and move the beam around, each movement increasing the risk of a handling accident. A shop with 'conventional' automation still needs about 20 minutes to move the piece from one machine to another, over to a workbench for coping and torch cutting, which all add up to the job cost. 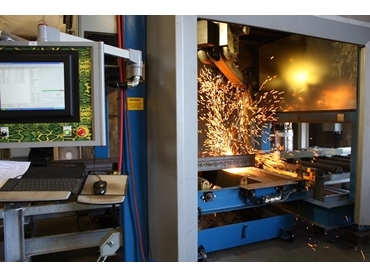 PythonX CNC plasma cutting fabrication machines on the other hand offer huge savings in floor space, labour and material handling with a single plasma cutting line automating the shop’s entire structural fabrication tasks into a single machine. According to Mr. Christensen, the PythonX can replace up to 10 machines used in conventional processes, saving on equipment cost, manual labour and double handling in machine shops. He explains that the normal way to drill a beam is to mark the holes, drill them out with a magnetic drill, use a handheld plasma or oxy cutter and then repeat this process over and over again, working out to about 20 hours of labour per tonne of steel. By using the PythonX, one can cut this down to about 5 hours per tonne, saving both time and money.